Provide comfort for the family of Carman Plester with a meaningful gesture of sympathy. Peacefully at Grey Bruce Health Services, Markdale on Friday, March 29, 2019 of Holland Centre in his 88th year. Beloved husband of Joyce Sanderson. Loving father of George(Janice) of Holland Centre, Laura(Harold) Cook of Dundalk, Douglas of Guelph and Carman(Kirsten) of Fergus. Step-father to Clinton(Kelly) Micks of Markdale and Cathy(Steven) Sir of Aurora. He is fondly remembered by 21 grandchildren and 10 great grandchildren. Carman is survived by 1 brother, Delbert, and a niece Jackie(Tim) Sprung. Predeceased by 3 brothers and 2 sisters. 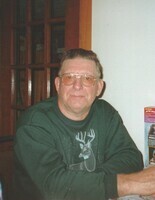 Carman was an avid hunter and angler, especially deer and coyote and had a great fondness of nature. During his working years he was a railroad conductor, farmer, and sheep shearer. Carman always had time for a visit, especially from his much loved grandchildren and great grandchildren and loved a game of cards. In lieu of flowers, donations can be made to the Holland Centre United Church or a charity of your choice. Cremation has taken place. A graveside service will take place at Flesherton Cemetery on Monday, April 1 at 1pm. To send flowers in memory of Carman Richard Plester, please visit our Heartfelt Sympathies Store. Donations are being accepted for: HOLLAND CENTRE PASTORAL CHARGE. We encourage you to share your most beloved memories of Carman here, so that the family and other loved ones can always see it. You can upload cherished photographs, or share your favorite stories, and can even comment on those shared by others. Provide comfort for the family of Carman Richard Plester by sending flowers. May the family of Carman Richard Plester please accept my sincere condolences hoping you find comfort in God's words at Acts 24 : 15 and Psalm 37 : 29.